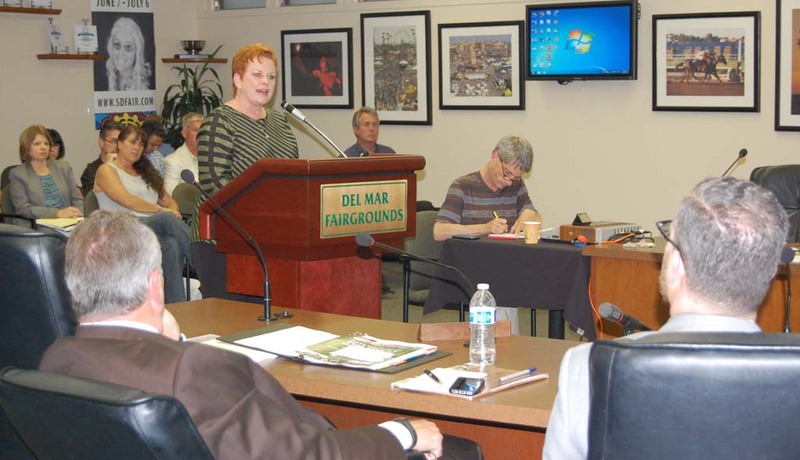 DEL MAR — Although she and her husband had already sent the governing board of the Del Mar Fairgrounds a letter stating Have Trunk Will Travel will not bring elephants to this year’s San Diego County Fair, company co-owner Kari Johnson attended the April 8 meeting to personally thank the directors, staff and fairgoers for their support during the past 29 years. Elephants are only able to become pregnant about three times a year, and once they give birth, only about every four to five years. One of their five female Asian pachyderms, which are endangered, is cycling during this year’s fair, which is the main reason the Johnsons announced March 27 they will not be part of the 2014 event. In the letter the Johnsons thanked fairgoers and staff for raising money for the International Elephant Foundation to fund a deadly virus that affects young elephants. “We will miss everyone this year but look forward to partnering in the future,” the letter also states. “We love you,” Kari Johnson said. Animal rights activists have been urging the fair board since 2011 to stop the rides during the annual fair. They accused Have Trunk Will Travel trainers of abusing the animals and claim the rides are unsafe. Since the March announcement, Kari Johnson said she has only received comments from people saying they will miss the elephants at the fair.